Marine Urethane designs and manufactures a full line of custom-moulded polyurethane products, ranging from vibratory bin linings to V-rollers for heavy-duty pipeline applications. The company uses polyurethane as it features the flexibility and lightweight properties of rubber, as well as the corrosion-resistant and load bearing characteristics of metal. Marine Urethane develops idler, hourglass, drive and stinger rollers for both shallow water and deepwater pipe barge installations. Polyurethane pipe rollers are a durable, strong and reliable solution for pipelay applications, and can be used on barges for transporting pipes. Urethane pipe rollers also ensure proper pipe system support, safety and operations. Temporary abandonment (TA) caps offer efficient capping for offshore wellheads. Designed for installations using remote-operated vehicles (ROV), TA caps are easy to manoeuvre and do not need davits, winches or other rigging equipment. As a result, they can be installed without disrupting rig operations, and on wellheads far from the rig. Polyurethane driver wheels and idler rollers are both rebuilt and adapted by Marine Urethane to fit a client’s unique design specifications. Driver wheels and idler rollers can be customised with diameters up to 10ft and lengths of more than 16ft, in addition to bespoke designs, moulds and inserts through the company’s in-house engineering capabilities. Marine Urethane carries a full range of hammer cushions for the pile driving industry, which are necessary to reduce wear and stress, as well as extend the life of a hammer. Available in small, medium and large-sized variants, Marine Urethane’s polyurethane pile driving cushions sit inside a helmet, and the hammer pad absorbs strike shock and transfers force to the pile. 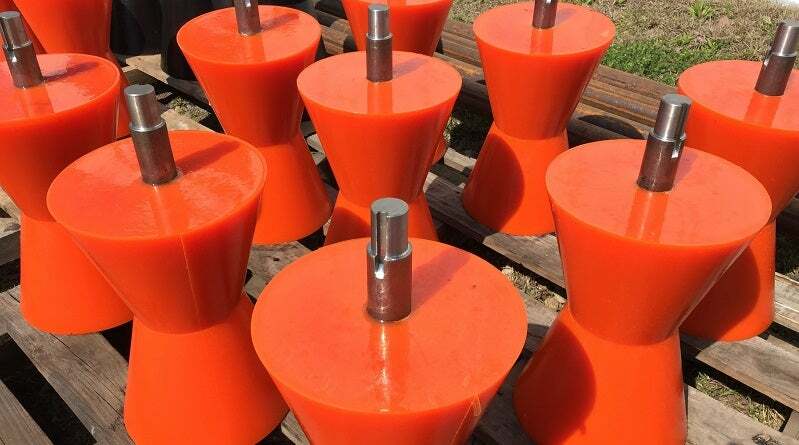 Marine Urethane manufactures a wide range of polyurethane hydrocyclones and centrifuge cones used in liquid and solid control classification for the construction, drilling and environmental clean-up industries. Hydrocyclones and polyurethane centrifuge cones are both used for liquid classification, effectively separating light and heavy liquid-solid mixtures. Marine Urethane hydrocyclones are made of polyurethane, which surpasses ceramics and metal in abrasion-resistance. Established in 1982, Marine Urethane is located in Houston, Texas, US, near Houston’s Bush Intercontinental Airport. The company’s facilities include a complete fabrication shop and machine shop for building inserts and moulds. With its industry and application expertise, Marine Urethane’s staff is available to assist clients with product design to ensure that their products will meet their application requirements. The in-house engineering department will design and manufacture the moulds. Final products are delivered on-time, on budget and according to the client’s specifications.